Eggs in a Garden Breakfast Tart - E. Armata Inc.
With the Spring Season in full bloom, so too is the local produce that makes for fresh and healthy meals! Easter is a perfect time to stock up on fruits and vegetables to make a holiday-themed healthy meal for yourself or your family. 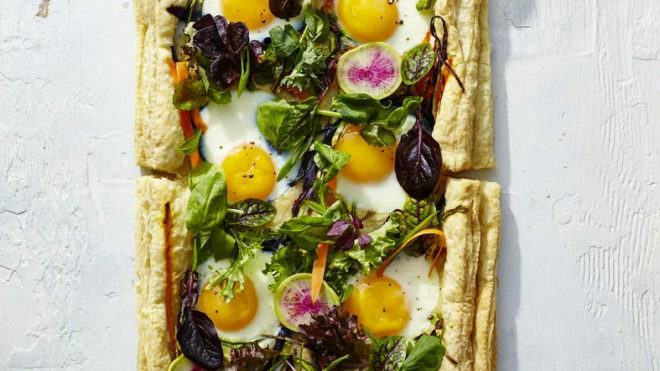 Full of healthy produce, this Eggs In A Garden Breakfast Tart recipe is sure to please even picky palettes. Total cook and prep time is 15 minutes and serves 8. Preheat oven to 400°F. Lightly coat a jelly roll pan with cooking spray. Lay 2 puff pastry sheets end to end in prepared pan; cut off any excess dough. Press seam of 2 sheets together with moistened fingers. Repeat procedure, layering remaining 2 puff pastry sheets on top of first 2 sheets. Using a vegetable peeler, peel asparagus and carrot lengthwise into strips. Reserve and set aside 1 cup of carrot strips. Using a 3-inch round cutter, lightly press 8 circles into puff pastry sheets. (Do not press all the way through the dough.) Spread asparagus and remaining carrot strips around the 8 circles; gently press vegetables into the dough. Sprinkle vegetables evenly with 1/4 teaspoon of the salt. Bake in preheated oven 15 minutes. Remove from oven, and cool on a wire rack 5 minutes. Using 3-inch round cutter, cut 8 circles from pastry, cutting all the way through to the pan. Remove pastry circles; discard or reserve for another use. Carefully break 1 egg into each hole. Sprinkle eggs evenly with 1/4 teaspoon each of the salt and pepper. Bake at 400°F until egg whites are set and yolks are still runny about 12 minutes. Remove from oven, and cool on rack 10 minutes. Place greens, radish, oil, lemon juice, reserved carrot strips, and remaining 1/2 teaspoon salt and 1/4 teaspoon pepper in a bowl; gently toss to combine. Arrange mixture around eggs. Cut pastry into 8 pieces, and serve immediately.